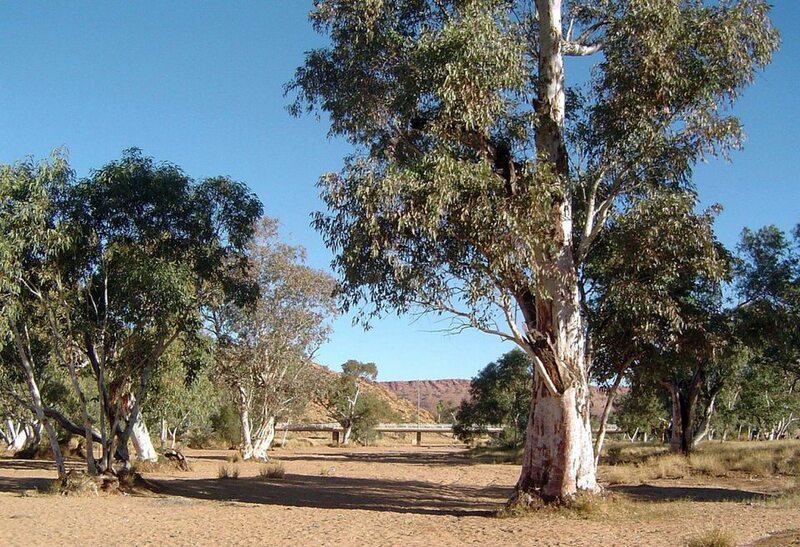 Alice Springs is in the Outback and is extraordinary, with monumental landscapes and open spaces. 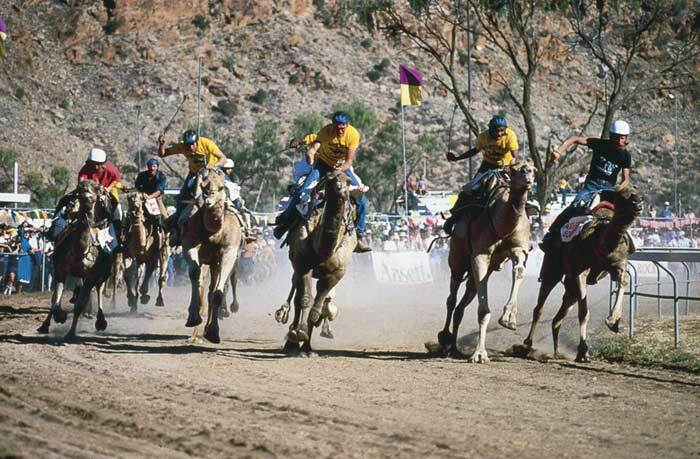 The heart of the region is Alice Springs and the region, as a whole, boasts a variety of attractions for the visitor. Alice Springs – a virtual oasis at the heart of Australia’s Red Center – is the home of the Royal Flying Doctor Service and the stopping-off point for one of Australia’s great wonders, Ayers Rock/Uluru. Visit the Alice Springs School of the Air in Head Street that uses radio communication to provide lessons for children living in remote Outback areas. The Royal Flying Doctor Service, in Stuart Terrace, operates a unique medical service to isolated towns, missions, and homesteads. The Museum of Central Australia has an exciting and absorbing display of Aboriginal culture presented through a creative use of light, sound and photographs. The Araluen Centre for Arts and Entertainment on Larapinta Drive features a 500-seat theatre, two art galleries including the famous Aboriginal artist, Albert Namatjira gallery, art and craft studio, and a bar and restaurant. Visit the Alice Springs Telegraph Station Historical Reserve which displays historic telegraph equipment at the site of the original Alice Springs settlement and communications post. Frontier Camel Tours run a camel museum on the Ross Highway. A guided tour includes an informative talk about camels in Australia, a short camel ride and an introduction to arid Australian reptiles. The Alice Springs Desert Park is a re-creation of three strikingly different desert habitats including the Arid Australian Reptile Display. In the way of nightlife in Alice Springs, Lasseters Hotel Casino offers blackjack, keno, roulette and money wheel. Visit Chateau Hornsby Winery, the Northern Territory’s first and only winery and vineyard and taste the wines of the Outback at the wine shed and enjoy lunch at the winery restaurant, or for something truly different try a bush barbecue under the stars using a camp oven kitchen. Rainbow Valley, 97 km south of Alice Springs features scenic sandstone bluffs and cliffs which form part of the James Range and are particularly attractive at sunrise and sunset. 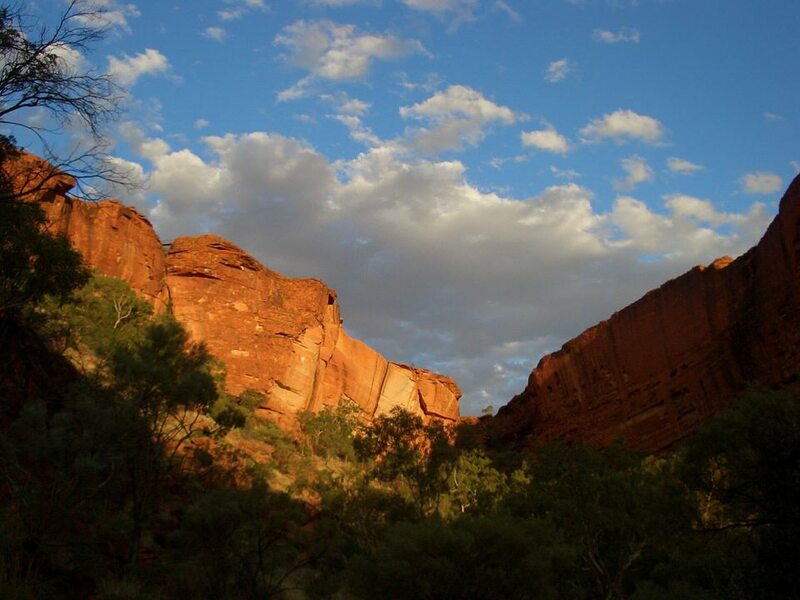 The park is rich in Aboriginal heritage and ochre paintings, artefacts and stone tools are found throughout the area. 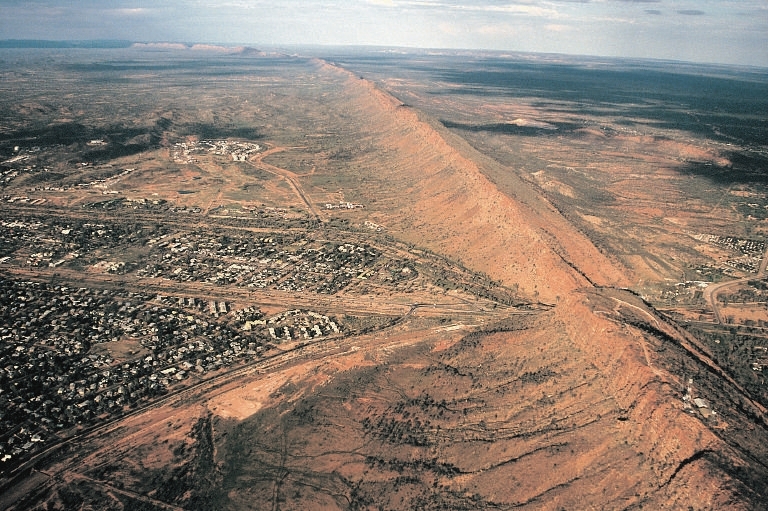 Chambers Pillar Historical Reserve is 165 kilometres south of Alice. This sandstone formation is a symbolic site in the Aboriginal Dreamtime and an important landmark in early Central Australian history. Ancient cycad palms can be seen at Palm Valley in the Finke Gorge National Park, 138 kilometres south-west of Alice Springs. Alice Springs is flanked by the MacDonnell Ranges. Eighteen kilometres to the west is Simpson’s Gap, with Standley Chasm 40 kilometres to the west. Further on are safe swimming holes at such spots as Ormiston Gorge and Ellery Creek Bighole. Kings Canyon, 330km (198 miles), west of Alice Springs, via the Ernest Giles Road recommended for 4WD only, is a mighty canyon of pastel-colored walls reaching a height of almost 300 metres and stretching for almost a mile. Visit the Lost City and Garden of Eden, noted for their lush vegetation of ancient cycad palms. Motel, lodge-style accommodation and campsites are available. Kings Canyon Resort caters for resort, backpacker and camping accommodation. Tours operate from Alice Springs and Ayers Rock by coach and air. Within the vast Uluru-Kata Tjuta National Park, 467km (280 miles) south-west of Alice Springs, are many Aboriginal sacred sites and famous rock formations such as the Olgas/Kata Tjuta and Ayers Rock/Uluru, the world’s biggest monolith. 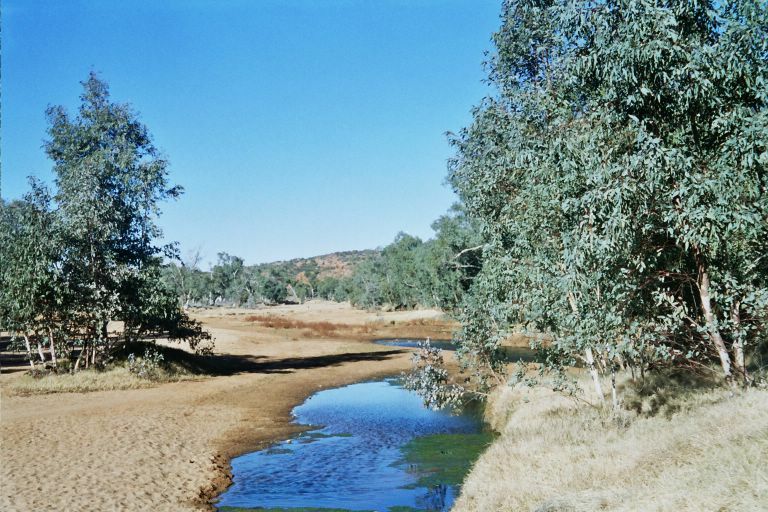 This area is of vital cultural and religious significance to the Anangu (the traditional owners) whose ancestors probably lived in the area for more than 10,000 years. Take a guided walk around the base of The Rock with a ranger and learn about the history and way of life of the local Aboriginal people. The Cultural Centre at the base of Uluru, showcases the culture of the area’s traditional Aboriginal owners. It takes about four-and-a-half hours to drive there or 40 minutes by air. Day and extended tours leave Alice Springs by air or coach. Ayers Rock Resort is made up of six properties offering a wide range of accommodation from luxury hotel to the campground. Superb restaurants, shops, art galleries, swimming pools and beautiful gardens making it a true oasis in the middle of the desert. Dine under a million stars at the award winning Sounds of Silence restaurant. At Ayers Rock/Uluru, conservation rangers take guided tours, explaining the traditional Aboriginal lifestyle and bush foods. Further to the west (132 kilometres) is the Hermannsburg Aboriginal community, a good stop-off point to meet the traditional owners of the area. This former Lutheran mission is now home to Aborigines and is a historic precinct with museum buildings and an art gallery. 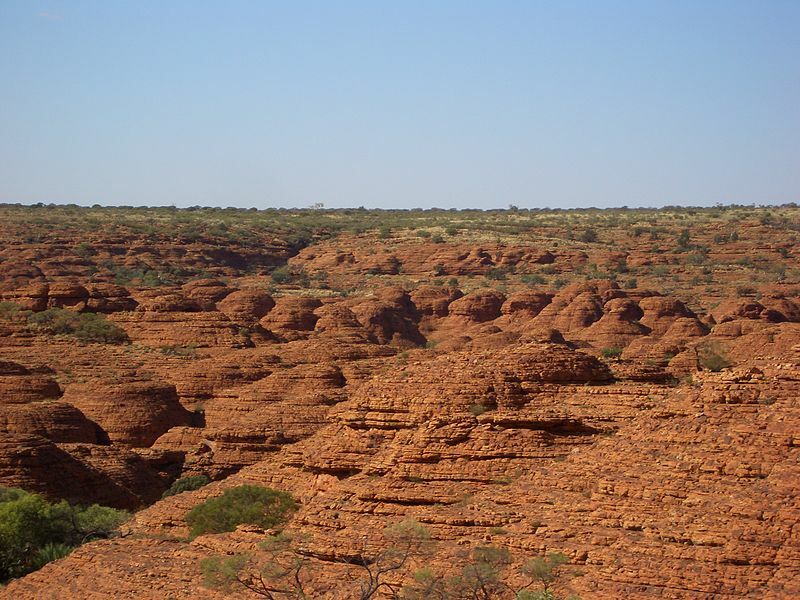 Kings Canyon also offers Aboriginal cultural tours. For expert advise try planning your Alice Springs vacation with our Virtuoso Travel Advisors, and get access to unparalleled experiences that transcend the ordinary. It helps us to help you, if you begin with our vacation planner, we’ll make make planning your Australia vacation easy and fun, save you lots of time, costly mistakes and arrange everything for you; air, car, hotels, and everything else you are dreaming about. We always strive to provide you the ultimate travel experience.